The (anarchist) Men Who Made America? I recently got a chance to watch the History Channel mini-series ‘The Men Who Made America’ about the rise of robber barons in the late 19th and early 20th century. The series isn’t perfect and suffers from many of the flaws all too common in basic cable documentaries but even so it is remarkable and worth you time for several reasons. While the series ends in a clumsy way, making Henry Ford look like the major progressive force behind the 8 hour work day, fair wages, and improvements in working conditions throughout the country and putting forth the argument that the robber baron era was essential to making the U.S. the best est, most civilized, and greatest nation on the face of the earth’, the rest of the series is much less certain on that point. In fact, there are elements of the series that are downright subversive. The series mentions the Anarchist movement in two places in the series and, in both cases, in a favorable light. That’s surprising because both mentions revolve around activity that today would most definitely be classified as terrorism. The first was the attempted assassination of Andrew Carnagie lieutenant Henry Frick. Frick was depicted as a cruel, exploitive ogre who got his hands dirty with the business of extracting labor from employees so Carnagie wouldn’t have to. In the end, Frick’s callousness contributed to the Jonestown flood and violently putting down strikes. The filmmakers were clearly setting Frick up to be the ‘bad’ robber baron who deserved to be struck down by an assassin’s bullet (Frick didn’t die, however) so that the ‘good’ robber baron (Carnagie) could ride in and save the day by firing Frick and beginning his campaign of philanthropy. Later in the series, Carnagie and the others engage in equally rapacious behavior yet it is portrayed differently than Frick’s episode. The latter had a vignette with workers huddled around the body of a dead co-worker, struck down by the unsafe working conditions. The former was merley done in a brief voice over with various pictures of life in late 19th century America and designed to not stick in the mind the same way as the latter. 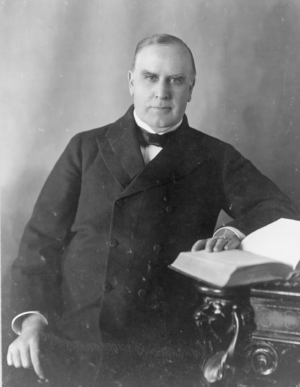 The second act of anarchism was the assassination of President William McKinley. McKinley was a wholly owned creature of the robber barons, not even given a part in the series and clearly not worthy of respect or consideration. His assassin was described sympathetically as a man at his wits end after being thrown out of his factory job. The assassination signaled a serious blow against the robber barons by ushering in Teddy Roosevelt presidency and the era of trust busting. In both cases, reform (really the only significant reform in the series before Henry Ford’s appearance) came about through the application of politically motivated violence, against the agents of capitalism. For the History Channel, I find that message curious and can only wonder at the underlying message there. Is this basic cable’s attempt to plug into the anti-capitalist sentiment of the 2008 crash and Occupy movement? If so, one must applaud the subtle way in which they did it. Superficially, the series is an homage to capitalism and entrepreneurs (and while the interviews with modern ‘mogels’ add nothing to the story, they do provide an interesting view of self-absorbtion and hubris) but I just can’t shake the feeling that there’s something else going on underneath the surface. The section of Ford seems hastily added on and doesn’t really fit with the rest of the narrative (and no mention of that whole Protocols of the Elders of Zion thing which, admittedly, would have been awkward). I can almost imagine some producer saying there needs to be a clear captialist hero and Ford was the one who fit in the time frame (or, perhaps, History Channel was hoping for a huge ad buy from Ford). The whole series could use a good editing and be brought down from it’s existing six hours (well, 8 with commercials) to a tighter, more effective three or four hour piece. Reviews have been rather ‘meh’ overall but my quick review of them all seem to take the show at its most superficial. There’s gold (well, ok, maybe electrum) in them thar hills!